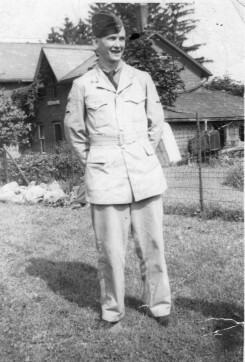 Verne Kennedy McCall, Leading Air Craftman, Royal Canadian Air Force (RCAF), was the son of George and Margaret (Calder) McCall who lived at Lot 15 Concession 13, East Nissouri Township. Verne trained in ground and airborne radar at Clinton RDF School (Radar Direction Finding) and Corpus Christie, Texas where the most advanced equipment at that time was 10 cm and 3 cm radar gear. He served from 1942-45 in such places as Nassau, Cairo, Egypt, and then Aden, Egypt. He serviced air borne radar as a Radar Technician for the Royal Air Force (RAF) squadrons #8 and #621 Middle East Coastal Command in Aden, Egypt for two years. In Nov. 1945 he was discharged from the RCAF but placed on the RCAF Reserve. On September 14, 1946 Verne married Sarah Ann Scott (1924-2004) and they raised two daughters - Linda and Karen.